The brain and these parts hindbrain, midbrain,forebrain. The brain of vertebrate begin at the anterior end of the spinal cord. When embryo develop then the brain undergoes regional expansion as a hollow tube of nervous tissue forms and develops into the hindbrain, midbrain, and forebrain ( see figure ). The central canal of the spinal cord extends up into the brain and expands into chambers called ventricles. The ventricles are filled with cerebrospinal fluid. The hindbrain is started from the spinal cord and and consist of following parts the medulla oblongata, cerebellum, and pons. The medulla oblongata is the large part of hinbrain and those point where the spinal cord enters the brain. It consist of reflex centers for breathing, swallowing, cardiovascular function, and gastric secretion. The medulla oblongata is found in all jawed vertebrates, reflecting its ability to control visceral functions and to serve as a screen for information that leaves or enters the brain. The cerebellum is also the part of hindbrain that next to the outgrowth of the medulla oblongata. It organize motor activity that associated with limb movement, maintaining posture, and spatial orientation. The cerebellum is different in organism. 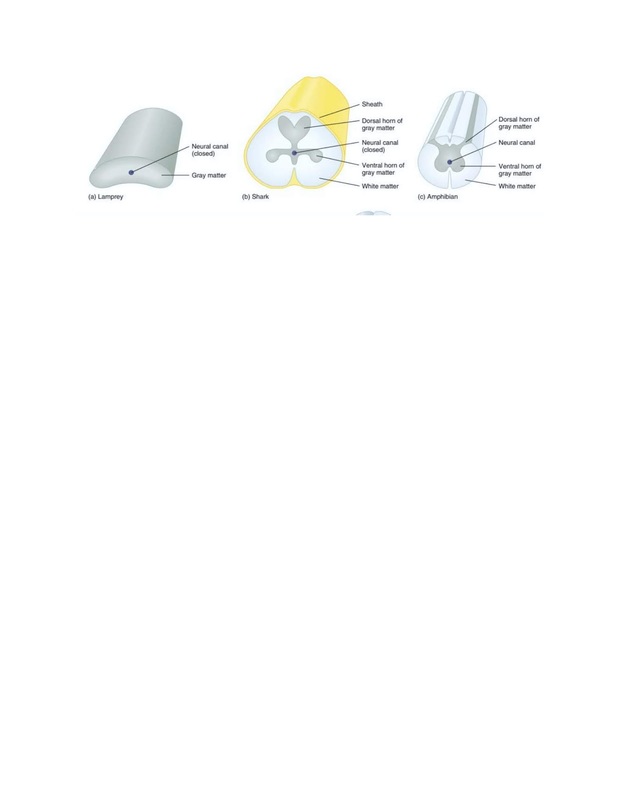 For example cerebellum in cartilaginous fishes has distinct anterior and posterior lobes. The cerebellum is much larger in birds and mammals—a reflection of complex locomotor patterns and a common evolutionary history of limb development and phylogeny as terrestrial vertebrates. The pons is a bridge in which nerve tracts transverse from the cerebrum of the forebrain to both sides of the cerebellum. It also contains tracts that connect the forebrain and spinal cord in all vertebrates. The midbrain is a center for coordinating reflex responses to visual input. When the brain evolved, it consist of following functions relating to tactile (touch) and auditory (hearing) input, but it did not change in size. The midbrain include the root that is called the optic tectum. It is a thickened region of gray matter that connect visual and auditory signals. The forebrain are anterior portion of the brain; the part of the brain that develops from the anterior part of the neural tube. The vertebrate forebrain has changed a great deal during vertebrate evolution. 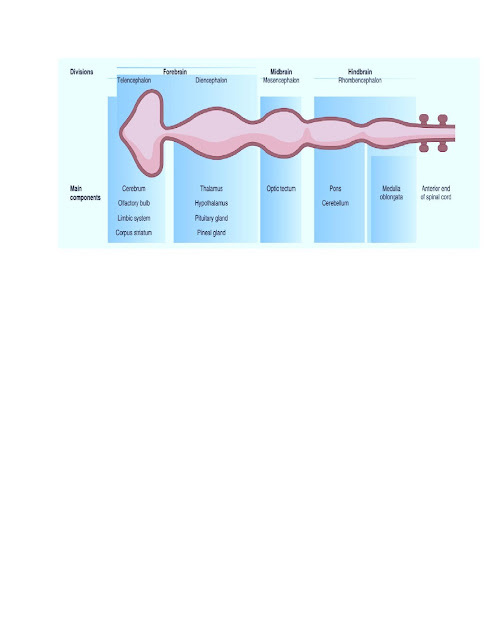 The forebrain has two main parts: the diencephalon and telencephalon (see figure). The diencephalon just lies in the front of the midbrain and include the pineal gland, pituitary gland, hypothalamus, and thalamus. The thalamus passing to all sensory information to higher brain centers. The hypothalamus lies just below the thalamus and perform many functions, such as body temperature, sexual drive, carbohydrate metabolism, hunger, and thirst. The pineal gland controls some body rhythms. Main components of telencephalon are the Cerebrum, Olfactory bulb, Limbic system, Corpus striatum. In reptiles and birds, the important part of the brain is the corpus striatum, which plays a role in their complex behavior patterns. As the diencephalon slowly expanded during evolution and handled more and more sensory functions, the telencephalon (the front part of the forebrain) expanded rapidly in both size and complexity. External to the corpus striatum is the cerebrum, which is a large groove divides into right and left cerebral hemispheres. The parts of the brain related to sensory and motor integration changed greatly as vertebrates became more agile and inquisitive. Many functions transfere to the optic tectum to the cerebral hemispheres. The increasing importance of the cerebrum affected many other brain regions, especially the thalamus and cerebellum. In mammals, the outermost part of the cerebrum, called the cerebral cortex, that increased in size and complexity. Different parts of the cerebrum have specific functions. What is spinal cord and their function???? The spinal cord is a thin, long, circular bundle of nervous tissue that support cells that spread from the medulla oblongata in the brain to the lumbar region of the vertebral column. The spinal cord is the part of central nervous system (CNS). The spinal cord have two important functions in an animal. It is connect the brain with other of the body, and it have the function of spinal reflex actions. A reflex is a predictable, involuntary involve to a stimulus. Thus, both voluntary and involuntary limb movements, in addition to certain organ functions, depend on this connection of brain with body. The spinal cord is the part of the central nervous system that start near the brain or go into the tail. A neural canal is present that contains cerebrospinal fluid. The gray matter contain cell bodies and dendrites, and is concerned mainly with reflex connections at various levels of the spinal cord. Extending from the spinal cord are the ventral and dorsal roots of the spinal nerves. These roots contain the main motor and sensory fibers respectively, that contribute to the major spinal nerves. The white matter of the spinal cord consit of the whitish myelin that covers the axons. Three layers of protective membranes called meninges surround the spinal cord. They are continuous with similar layers and cover the brain. The outer layer, the dura mater, is a tough, fibrous membrane. The middle layer, the arachnoid, is delicate that connects to the innermost layer, the pia mater. The pia mater consist of small blood vessels that nourish the spinal cord.